Schecter’s success in the past decade has been nothing but expected. After all, they have given the metal scene exactly what they wanted for a long time. Schecter Omen Extreme 6 is a great example of this. Aside from being one of the most capable guitars you can grab for under $500. It’s also a true performer. When they first started building guitars of their own, Schecter stuck to a pretty simple body shape. We are talking about an arched Super Strat design, which merges several great features. The body itself is made of mahogany, and covered by an attractive quilted maple top. The neck is a solid maple piece which features a profile suitable for speed and accuracy. The top, as well as the neck, are bound with white abalone, while the rosewood fretboard features Pearloid Vector inlays. When you look at the entire package, Schecter Omen Extreme 6 looks simply gorgeous. 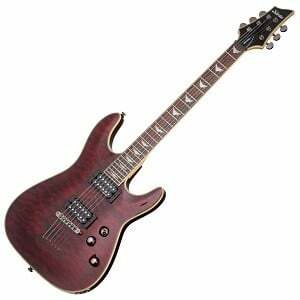 In terms of electronics, you get a set of Schecter Diamond Plus passive humbuckers. While they might seem to be a bit crude at first, you will grow to like them as soon as you figure out just what they are capable of delivering. Pickups are wired to a set of two volume knobs, one push-pull enabled tone knob, and a three-way pickup select switch. The bridge pickup is a Diamond Plus and the tuners fit the style of this six string miracle. This particular model uses Metal Knurled with a set screw knobs. The Omen Extreme-6 is one of the few models that come with good strings that do need a quick replacement. One of the things people noticed and grown to like about Schecter guitars are their Tune-o-Matic bridges. With that said, Omen Extreme 6 comes with well set up Floyd Rose bridge. On the headstock, you will find a set of locking tuners which compliment the already capable bridge quite nicely. These two components alone should tell you that Schecter Omen Extreme 6 is geared toward those players who like to lose themselves when it comes to bending strings and picking chords. Needless to say, the hardware works and it works great. If you need something capable of handling heavy gain distortion and still sounding somewhat decent, Schecter Omen Extreme 6 is the type of guitar you are looking for. Those pickups are simply great considering they are an in-house built pair. Guitar itself has a lot of range to offer. Dialing in various distorted and clean tones is pretty easy, and so is going several keys lower with your tuning. There’s more than enough gain to deal with both of these issues. In other words, if drop D or deeper is something you’re interested in, this guitar might be the perfect answer for you. While many will come out and say that Schecter Omen Extreme 6 is an entry level model, and criticize its passive pickups, the fact is that this guitar packs a punch few expect to see. In many ways, Schecter Omen Extreme 6 is a working musician’s tool that can keep up with you no matter what your expectations are. For more info about the Schecter Omen Extreme 6, click here. For more electric guitars for less then 500$, click here.